Say you want to create a guide line ending at a specific distance, passing through a specific point. 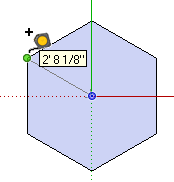 Activate Tape Measure, make sure the "plus" sign appears on the cursor (press Ctrl / Option if not), and click the center point. Then click the corner point. This creates an infinite guide line passing through the two points you clicked. If you then try to size this guide line by typing 4' and pressing Enter, you'll be asked if you want to resize the model. 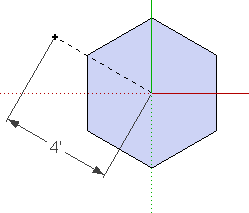 Clicking Yes would change the hexagon so that the distance between the center and corner is 4' - not what I'm looking to do. 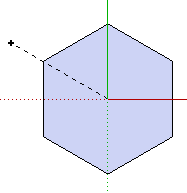 Starting over, here's how to do this: Activate Tape Measure, click the center of the hexagon, then HOVER on the corner point. Type 4' and press Enter, and here's your guide line. This entity is actually considered to be a guide point, and not a guide line. So if you right-click on the guide line and choose Entity Info, you'll only see its entity type, not its length. But you could always check its length with the Dimension tool. 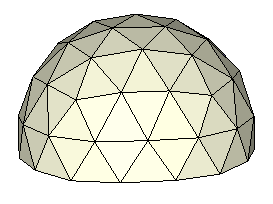 This is necessary for creating a geodesic dome because all corners of the dome must be the same distance from the dome's center. Went back to basics, we'll look at. 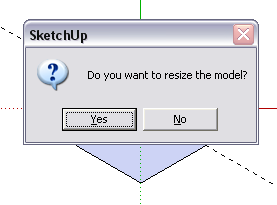 First time in ages, thank you remembered features of Sketchup.